Hey! I have an outfit post for you today from my trip to Sweden a little while ago. I bought this amazing skirt when I was there after watching some episodes of Pushing Daisies and feeling very inspired by the character Chuck. She always wears fab poofy '50s skirts. The show was on TV a while ago but I was recommended it by a friend recently and now I'm hooked. It follows the path of a man, Ned, who can bring people back to life if he touches them. If he touches them again they go back to being dead and he can't revive them. But after touching them once, if they are alive for more than a minute someone in close proximity has to die in their place. It's a little confusing but the first episode explains it well. Chuck is Ned's childhood sweetheart who he brings back to life. However it's almost painful to watch as they are so in love but they can't touch. The two and a private investigator solve crimes together by reviving murder victims and asking them who killed them, then collect they reward. The best part of the show is by far Chuck's wardrobe choices, and the fact that Ned owns the coolest pie shop ever but that's a separate matter. 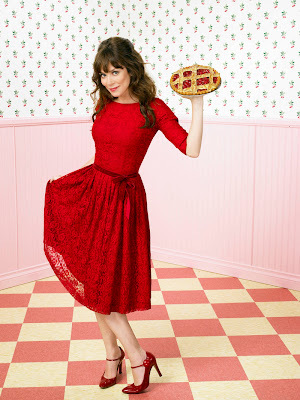 It was an amazing coincidence that on the same day of watching the show and buying the skirt my grandma made pie for pudding without me even mentioning it to her. It was all very aesthetically pleasing and the pie was every bit as good as it looks. I'd really like to do a full lookbook inspired by Chuck so let me know in a comment if you would be interested! OMG ! I didn't even know tartan tights existed ! I love this outfit. Pretty simple yet so different ! I think you should do the lookbook thing. I don't watch it but it would be interesting to see her skirts and clothes and how you have been inspired in to what you wear ! You look so cool!! U have very pretty hair and the show you mentioned looks amazing! The pie looks so delicious! !